I know that Dickens was very involed in amateur theatre productions throughout his life, but I wonder if anyone has ever looked at how these might have influenced his work. It's not movies, but any means, but similar in a sense. What he's very good at is manipulating his readers, which I enjoy when he's doing it and which he does a lot in Tale of Two Cities. I just listened to Bleak House and then I got the BBC mini-series from the library. I really enjoy listening to Dickens but I agree that his books make great movies too. I'm surprised that there hasn't been a modern video treatment of it too. 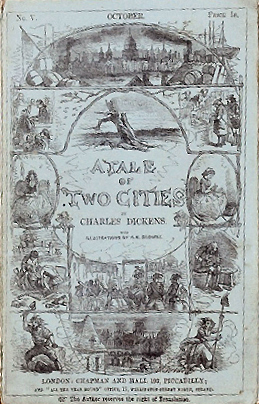 Maybe now that Anna Karenina and Les Miserables and The Hobbit are coming to the big screen we'll see someone take on A Tale of Two Cities. CB James: I definitely found A Tale of Two Cities to be more cinematographic. Gypsysmom: Shamefacedly, this is only the 2nd Dickens book I've ever read (the first was A Christmas Carol). Interesting, your interpretation of the opening sentence. I have always taken it to refer to competing feelings within an individual. I like that it can have such an ambiguous meaning. Barbara: I think that's the beauty of it, it's such a versatile thought.